With so much data, analysts have the power to explain, enlighten or confound. Unfortunately, with a lot of businesses stuck in old ways of reporting metrics, a lot of information is presented quite poorly. That means confusion, bad analysis and, ultimately, poor decisions. Let’s look at four ways we report metrics badly and the solution to each problem. To create the examples below, I’ve taken complaints from the Consumer Financial Protection Bureau. This is a hard one to avoid because a lot of business people want a dashboard that shows daily data over the past week, or weekly data over the past month. There are times and places for such a dashboard, and usually it’s as an IT quality control tool (or perhaps the launch of a new product). Even so, without context it usually makes little sense to present a week (or even a few weeks) of data. Take a quick example below from our financial complaints data. Showing four weeks of data may alert us to discrepancies, but it’s just too little data for us to make much sense. The below is better simply because we’re giving our audience more to draw on. They can see whether recent weeks are out of character and which trends are starting to shape up. If you’re used to looking at data out of context, you may hear your boss freak out about a recent off month. Then someone will recall, ‘didn’t we have an off month last year at this time?’ Below is a visual that looks at data year over year, which is especially useful if you’re in a seasonal business. I love a good table as much as the next person, and I find visualizations without some numbers integrated with the graphs somewhat frustrating. After all, like most managers, I’m busy and lazy. Some may see a line graph and scoff that they want actual numbers. But give them the below, and listen to them complain that they can’t see the trends. We can get the best of both worlds by using a line graph and labeling with actual numbers. Now we see trends AND we have our lovely set of numbers for reference. If we want to combine some context, maybe we add in more history and just label the ends like below. Sometimes I like a nice, clean graph. But all the graphs above are a little too simple. And too much simplicity gives you a small part of the story. 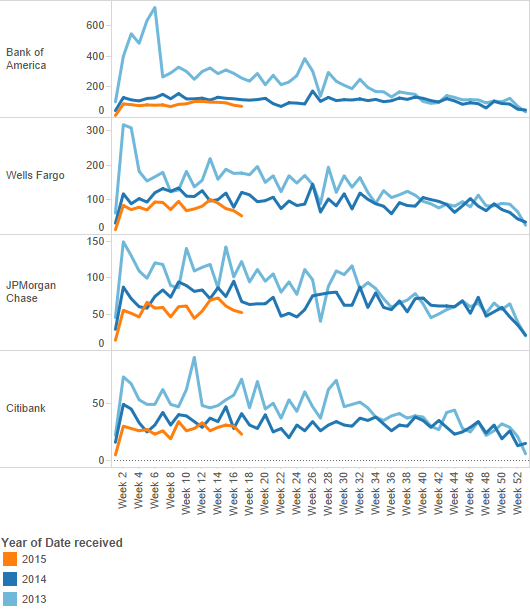 The financial complaints data set has a lot of dimensions. 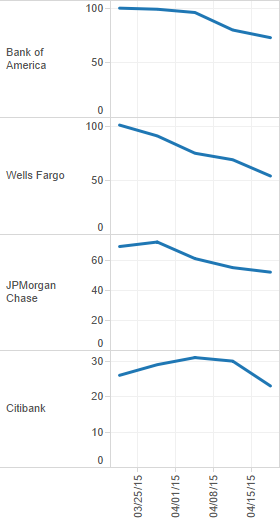 Below is a more complex look at the top four banks with % of complaints by product over time. In this way we can see that most of the banks have seen less mortgage complaints as a share of total since 2012. 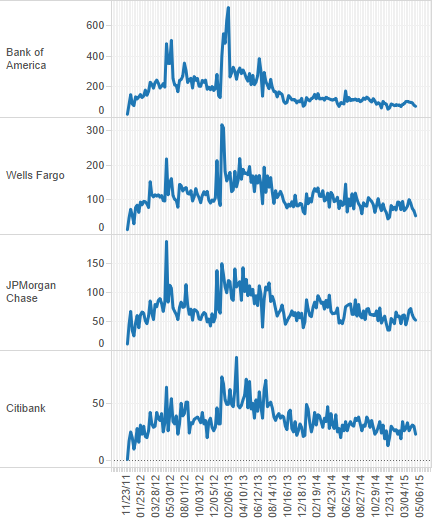 There was a spike in early 2013 for all the banks, that then subsided. On the other hand, bank account and debt collection complaints are growing. Graphs are tools. You wouldn’t use a screwdriver to hammer in a nail, or lift your car with a ruler. In the same way, when you’re trying to see insights in data, there’s always a particular way to graph that will be easiest for your audience to understand. I used to be guilty of creating stacked bar graphs to show multiple trends over the same range of time. But you really only see two trends in the graph below – overall and Citibank. Because the bars for JP Morgan, Wells Fargo and Bank of America don’t start at the same place, you’re forcing your viewers to chase after illusions of trends. These pie charts are even worse. We can kind of see that the pies get larger and smaller, but by what magnitude? And it’s nigh impossible to see the change in angle per year. If you want a % of total over time, I’ve been entranced by the below graph in the past. It’s certainly easier to read than the previous two, but we still face the problem of not being able to see trends for Wells and JP Morgan. However, when you have a lot of variables and the ability to highlight/play with the data, then the below graph can prove useful. The right tool to recognize trend patterns is a line graph. We only have four lines, so we can easily switch the above bars to the below. One of the most powerful ways to visualize data is to use small multiples. This is a series of similar charts using the same scale and axes, allowing easy comparison. In this way you can visualize a lot of dimensions in a small area. Below is a small multiples map of New York city zip codes shaded by percentage of complaints that did/did not receive a timely response. Using this configuration we can compare non-timely responses for four banks across three product lines on a two-dimensional map. That’s a five-dimensional view of our data: bank, product, timeliness, longitude, latitude. In conclusion, just by avoiding some common pitfalls in some common graphs, you’ll be far better positioned to find those earth-shattering insights that will transform your business. And if you’re curious about whether some trends are affecting others, don’t hesitate to make your graph as complex as possible. There will always be time to clean it up later.